We had 2 days off from baseball... I know shocker!?!?!?! However, it was like we did not know what to do!?!?! Most people would probably be so excited to stay home... not us! We don't stay home... I don't think we know how to! So we headed to the lake Tuesday afternoon and come home Wednesday evening. It was a quick but fun trip! During the week is the best time to go to the lake...no one is there... we had the whole lake to ourselves... it was great! And we got smart this trip... we figured out how to let jackson ski and brylee tube at the same time... holler!!!! This means no one is in the boat whining or asking when it was their turn! :) Don't worry we told jackson he could not go across in front of brylee on the tube.. he would only go our side the wake on his right side!!!! 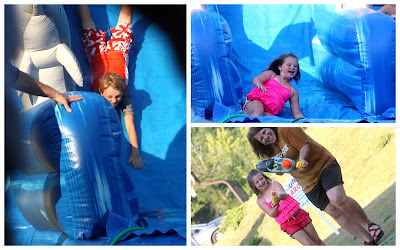 We came home Wednesday night because they were having splash night at church and the jax and bry were so excited they could not wait!!!! They had a big water slide and lots of squirt guns too! Fun Times!!! !